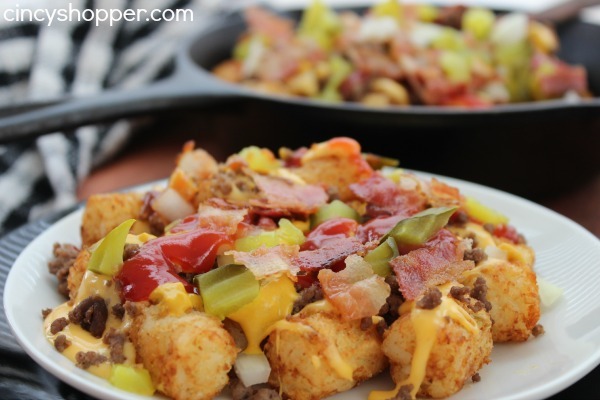 These Bacon Cheeseburger Tatchos are absolutely amazing. This afternoon the kiddos were home from school as it was a day off for them. I needed to whip up something to keep them out of the fridge all day long. I had seen all these great Tatcho Recipes online and thought it was time to give them a twist of my own. We had great success with our bacon cheeseburger pizza and everyone LOVES it. 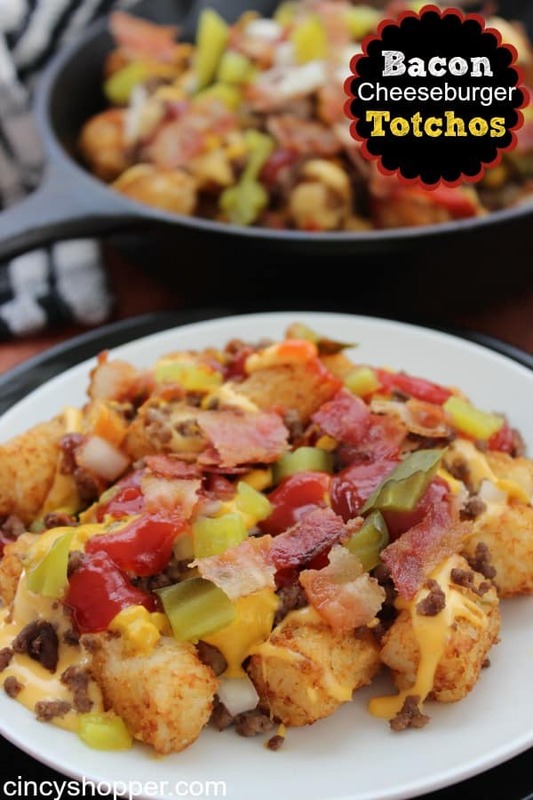 So I was thinking why not toss bacon cheeseburger toppings onto Tater Tots. The flavors all work so great together. This Bacon Cheeseburger Tatcho Recipe would be great for a Super Bowl Dish this weekend (I plan to remake for Company on Sunday). 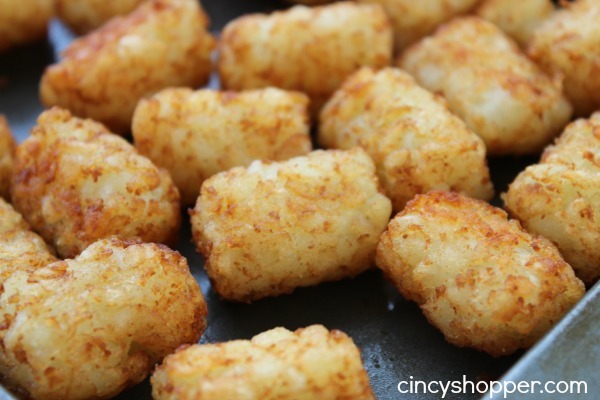 I snagged Tater Tots on a sale at Kroger this week and I had the ground beef in the fridge. I also had Velveeta left over from another recipe. Oh and if you need bacon (it has been so high priced lately), I found Kroger precooked bacon for just $1.50 per package on Monday. PrePackaged bacon is so quick simple and was priced right, ha ha! Bake Tater Tots according to package instructions. Cook bacon slices and cut into 1″ pieces. 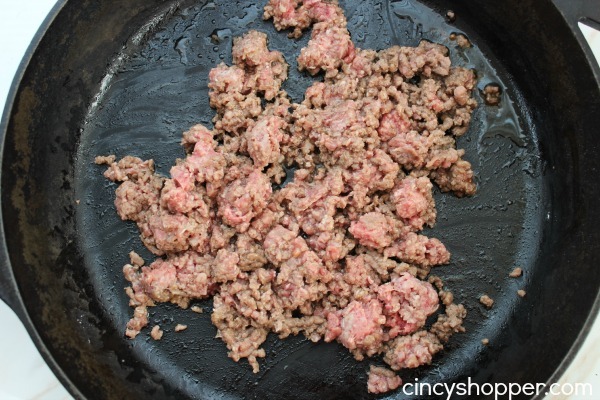 In a skillet cook ground beef, Worcestershire, onion powder and garlic powder until brown. Drain grease and set aside. Melt Velveeta with milk, mixing well. Arrange Tater Tots on serving platter. Spread browned ground beef over cheese. 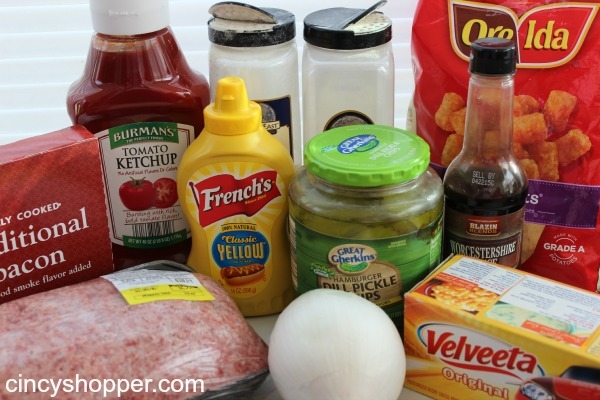 Top with mustard, ketchup, diced onion, diced pickle and bacon. 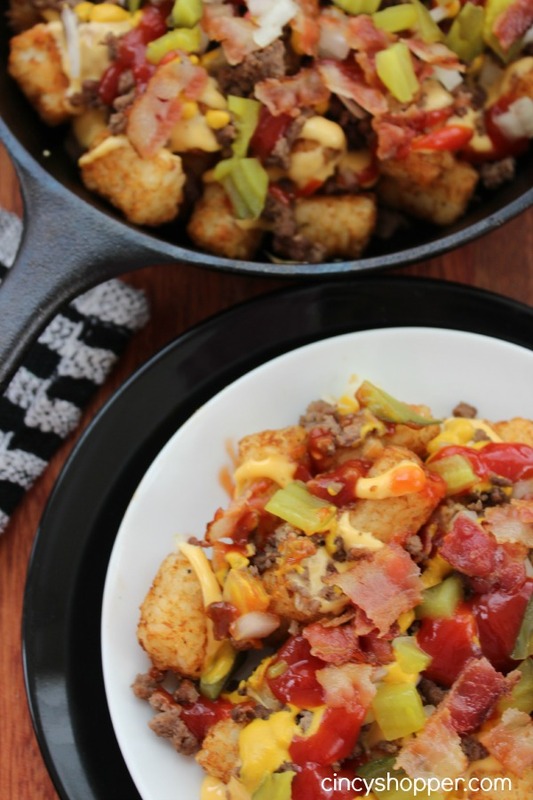 All the flavors of a Bacon Cheeseburger on top of Tater Tots. So so Good! The hubby decided to heat up a plate when he arrived home and was wanting more! He thought they were amazing! I was thinking that this would probably work well as a casserole dish too! I think I will try that way next time around. 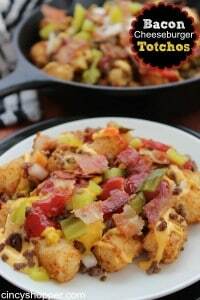 If you are looking for some other great appetizer recipes for your Super Bowl entertaining be sure to check out my Bacon Deviled Eggs, Roasted Red Pepper Dip, Pepperoni Pizza Crescents, Slow Cooker Cheesy Mexican Dip, Buffalo Chicken Dip, Mini Chili Dog Crescents, Mini Taco Bowl Bites, No Fry Buffalo Wings, Homemade Chips and Salsa, Philly Cheesesteak Sliders, Bacon and Jalapeno Cheese Ball , Sloppy Joe Sliders, the Caramel Apple Dip or even the Filet Mignon Bites with Bernaise I have shared with all of you. Cook bacon slices and cut into 1" pieces.